Bricklayer kills friend for refusing to charge phone - BlogIT with OLIVIA!!! A bricklayer, Demola Wasiu, has been arrested by the Lagos State Police Command for allegedly killing his friend, Lekan Omotosho, 27. Wasiu, an indigene of Ede, Osun State, stabbed the Ogun State indigene in the armpit after he refused to charge his phone for him. 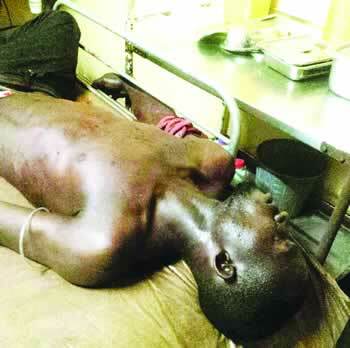 He said, “Just two months ago, the police arrested him while watching over Wasiu’s phone. The problem is that they usually smoke hemp in that place where they charge phones. Throughout the time of his detention, this so called friend did not check on him. Punch gathered that the suspect, who had a bottle of beer in his hand, smashed it on the floor and stabbed Omotosho in the armpit. Oyinloye said, “He fell down and started bleeding. People took him to a hospital, while they held Wasiu to prevent him from escaping.